Editor’s note: The Islamic State in Iraq and Syria has drawn worldwide attention for acts of brutality against hostages. To find out how Cambodian Muslims, or Cham, view ISIS and their latest actions, VOA Khmer recently spoke with Eng Kok-Thay, author of “From the Khmer Rouge to Hambali: Cham Identities in Global Age,” and the research director at the Documentation Center of Cambodia. VOA: First, I would like you to tell our listeners who ISIS is. Eng Kok-Thay: ISIS is a group that currently occupies a big part of northern Iraq’s territory and northern Syria. The most important ideology of this group is Islamism, which means this group requires the use of Islamic law in the country that it occupies and uses it to control the lives of all the people who live in the area it occupies. In the future ISIS aims to create an empire that covers the entire Middle East. VOA: How did this group start and who is its leader? 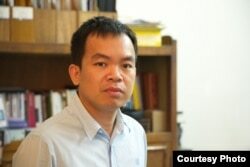 Eng Kok-Thay: This group was initially a part of the terrorist group al-Qaeda, around 2002, 2003 and 2004. But then, after al-Qaeda lost its popularity, especially after the shooting that killed its leader, Osama bin Laden, ISIS separated itself from al-Qaeda. At first, ISIS was led by Abu Musab al-Zarqawi, from 2003 until 2006. But after Zarqawi died, there was a new leader, named Abu Bakr al-Baghdadi, who is the current ISIS leader. At first, ISIS didn’t have much popularity in Iraq, Afghanistan, or in Syria. But after the outbreak of civil war in Syria after the Arab Spring in the Middle East, ISIS had a chance to change. This group joined other rebels to fight in the war against Syrian President Assad’s government, and took that opportunity to expand its power in Iraq. At that time, the government and military of Iraq didn’t fight against ISIS that hard, and a lot of soldiers dropped their weapons and fled from the area that was supposed to be protected, which allowed ISIS to easily occupy [parts of] Iraq very rapidly, in mid-2014, and a big part of Syria at the same time. VOA: Based on your research, are there any Cambodians among ISIS militants? Eng Kok-Thay: We haven’t found any evidence to prove that yet. In June 2014, ISIS uploaded a 13-minute video to persuade other fighters or its members from other developed countries to join the group, and in that video ISIS said that they have members from many countries, such as Bangladesh, Iraq, Australia, Britain, and including Cambodia too. So at that time, journalists in Cambodia asked the same questions to the Islamic leaders, as well as leaders from the Cham community. They didn’t receive any information that any Cham people had joined ISIS, and we don’t have evidence to demonstrate it either. I think it is just propaganda from ISIS to argue that its political battles have been strongly supported from people all over the world. It is also like the accusation against Cham people in early 2003, 2004 and then in 2007 that Cham people had joined with terrorists in the world, and some even accused Cham people for taking part in separatist activities in southern Thailand, as well. But none of those accusations have been supported by any evidence. VOA: What about the Muslim community in Cambodia, how have they reacted to the cruelty of ISIS? Eng Kok-Thay: Cham people and a lot of Muslims that I have met and asked about the cruelty of ISIS, as shown uploaded to the Internet, especially the beheading of journalists, humanitarian workers and other hostages—Cham people have condemned these brutal acts. And they say that Islam, as they understand it, is a religion that is full of peace and about uniting together without any racism. They have been raised a country in Asia, like Indonesia, the biggest Muslim country in the world, and Indonesia is Cambodia’s neighbor, and these two countries have never gotten into conflict with each other. ​VOA: In your book, which was released in January, you write about the challenges that Cham people have faced, including some discrimination after al-Qaeda began its activities around 10 years ago. Because of the current activities of ISIS, do you think that Cham people in Cambodia could face any danger? ​Eng Kok-Thay: I don’t think there are any dangers to Cham people in Cambodia, especially in terms of social prejudice against them as a result of alleged connection with ISIS. For Cham people, it is certainly not the first time that they have been accused of being part of a terrorist movement or taking part in a war movement in another country. And in general, our government policy is to protect Cham people and to oppose all terrorist activities that could happen in Cambodia. Actually we don’t have any evidence to show that Cham people in Cambodia have joined ISIS at all.